Rescues are often accused of being a bit of a broken record when it comes to neutering - sometimes it seems we're obsessed and its all we are ever interested in. 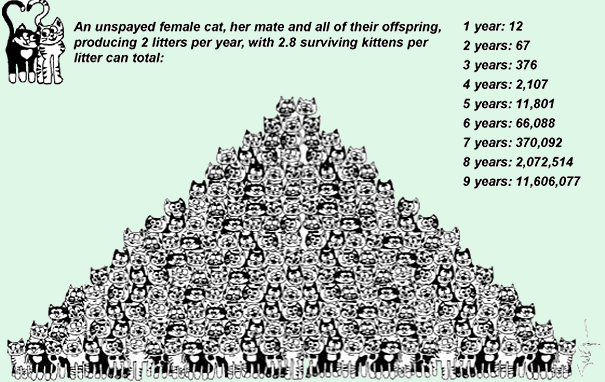 That's largely because rescues are at the sharp end of the results of people not having their cats neutered. I confess that when I had my first cat after I left home, I didn't get him neutered for several years, just couldn't see why I should. It wasn't bothering him, it wasn't bothering me. I didn't know any different, and I suspect many others who aren't involved in rescue don't either. Not surprising then that they wonder what's hit them when they open their mouth and a group of rescue people jump down their throat about neutering. Just for the record - I did finally get him neutered when we moved house and he was unsettled and took to spraying my record collection! MYTH: It's better to have one litter before spaying a female cat. FACT: It isn't. Medical evidence indicates just the opposite. In fact, the evidence shows that females spayed before their first heat are typically healthier. Even if it were better, it would need to be weighed against having produced another litter of kittens who may not find a home, each of the females in which would then need to have a litter, and so on exponentially. FACT: The miracle of birth is quickly overshadowed by the thousands of cats who end up being put to sleep simply because there are not enough homes to care for them. Teach children that all life is precious by spaying and neutering your pets. MYTH: But my pet is a pedigree. FACT: Pedigree cats are not immune to the problem of being homeless. There's no need to add to them. FACT: Pets don't have any concept of sexual identity or ego. Neutering will not change a pet's basic personality. He doesn't suffer any kind of emotional reaction or identity crisis when neutered. It's more likely to be an issue about your sense of maleness ... in which case you should consult your GP. FACT: Your cat's kittens have an unlikely chance of being a carbon copy of your pet. Even professional breeders cannot make this guarantee. There are rescue cats and kittens waiting for homes who are just as cute, smart, sweet, and loving as your own. FACT: It's not that expensive - it's worth phoning around a few vet practices as costs can vary quite widely. It may also be possible to get help with the costs of neutering: http://www.cats.org.uk/what-we-do/neutering/financial-assistance. MYTH: I'll find good homes for all the kittens. FACT: You may find homes for the kittens. That's great if you do - but that will mean fewer homes for the kittens who are waiting in rescues up and down the country who may never find a home. • There are around 2.5 million stray cats living in the UK. • Pregnancy and motherhood are physically very demanding for a cat - repeated pregnancies take their toll a cat can have up to three litters a year with five or six kittens in each litter. That adds up to 18 caring homes for cat rescue centres to find each year - for just one cat's kittens! 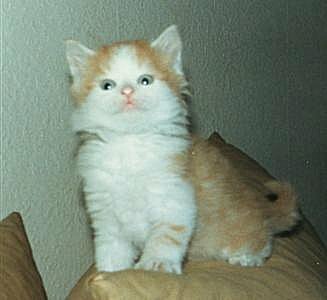 The second cat I had arrived 20 years after my tom cat. We'd not been planning on having a cat, but she turned up in the yard one day and persuaded us that we should give her free board and lodgings. She was only about 6-9 months old the vet said, and he recommended we get her spayed right away. I'd heard the stuff about them having just one litter, that's what my mother had said about all the cats we'd had. I was shocked when the vet said just how many strays there were and how lucky Midgecat was to have dropped by our house - partly I was shocked as Midgecat had convinced us she was doing us a big favour by choosing to move in with us. I was anxious about the op but absolutely wanted to do the best for her. Funny what you remember, but I remember the receptionist at the surgery saying it was the kindest thing I could do for her. Its only in recent years I've really understood what she meant. Anyway lots of anxiety and tears. I felt dreadful about not feeding her the morning of her op, and about leaving her with the vet. Like a mum on a child's first day at school I paced around at home, not quite sure what to do. Went out and bought her a toy, something she could snuggle up with because 'obviously' she wouldn't feel up to playing much when she came home. Sick room all ready, light easy to digest food available. She strolled out the basket, wolfed down the light, easily digestible meal and then asked for her supper. Then she pushed the kitchen door open and squeezed through with door rubbing against her side. came into the lounge and flopped down on the side her wound was on. I nearly fainted. She however, was totally unconcerned and started playing chase with her toys. I say this because it might be helpful to know that the op isn't nearly such a big deal as we might think. Midgecat had to go back some days later to have her stitches out, but these days most vets use dissolving stitches, and for tom cats its such a small op that they don't even need a stitch! Neutering and spaying are ops that vets must do hundreds of in a year - its quick, techniques and anaesthetics are improving all the time. Obviously all ops carry a risk, but weighed against the risks of not having it done its a no brainer really. Since Midgecat I've taken more cats to be spayed than I would ever had dreamed of! Most vets say not to feed them from 8pm the night before they're booked in for the op - if they're young kittens they can have food until later in the evening. You'll most likely need to get them to the surgery first thing in the morning. The op itself takes only a few minutes however they'll need time to recover from the anaesthetic and for the surgery to check they are completely ok before they go home. However they're usually ready to come home by mid afternoon. On the whole the worst 'ill effect' is that they're hungry and still remember you didn't give them breakfast! And the other cats in the household realise they don't smell the same way they normally do, and there's a bit of hissing. Most vets will ask you to bring them back after a few days just to check that the wound is healing ok. Thankfully we've never had one that hasn't. The right age for neutering?